Commotio Cordis refers to the sudden arrhythmic death caused by a low/mild chest wall impact. 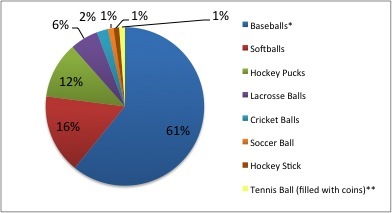 Commotio Cordis is seen mostly in athletes between the ages of 8 and 18 who are partaking in sports with projectiles such as baseballs, hockey pucks, or lacrosse balls. These projectiles can strike the athletes in the middle of the chest with a low impact but enough to cause the heart to enter an arrhythmia. Martial arts is a sport in which a strike of a hand can also cause the heart to change it’s rhythm. Without immediate CPR and defibrillation the prognosis of commotio cordis is not very good. This condition is extremely dangerous with rare survival. 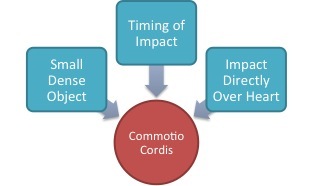 How do you prevent commotio cordis? Commotio cordis caused from sports equipment. * Includes 4 T-balls. **Training device used for baseball pitchers. Adapted from: Maron BJ, Gohman TE, Kyle SB, Estes NAM, Link, M. Clinical profile and spectrum of commotio cordis.J Am Med Assoc. 2002;287(9):1142-1146. “Timing of Impact” refers to the timing of the object hitting the chest during the cardiac cycle. 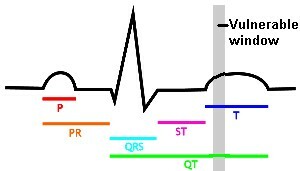 The heart is most vulnerable when it is struck at the beginning of the T-wave. This part of the cycle indicates the refilling of the heart’s ventricles. How do you treat an individual with commotio cordis? Use an AED and defibrillate as quickly as possible. For every 1 minute delay in getting shocked by the AED there is a 10% decline in survival rate. Using an AED is the best practice and gives the athlete the greatest chance of survival. Immediately activate EMS and the school’s Emergency Action Plan. 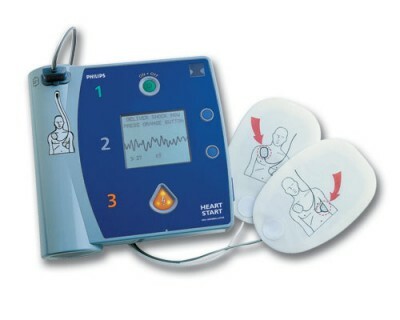 Continue AED use and CPR until EMS arrives and takes over. Before returning to play that athlete should have a cardiac evaluation including ECG by the athlete’s physician. Physician clearance is necessary before returning to practice. The athletic trainer should use clinical judgement during return to play and should carefully watch the athlete to ensure a cardiac episode does not occur. Adjust practice by adding personal protection such as chest padding or switching to safety balls to decrease the chance of another incident.